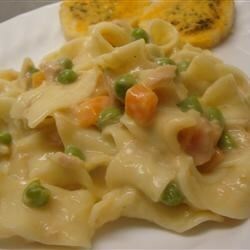 "This is so easy and fast, like tuna casserole without baking it! Top with French-fried onions, if desired." You can use cream of celery soup instead of the cream of mushroom, if you prefer. I am a "new" cook and this recipe turned out fantastic. I really got raves on it.